For many years, Hong Kong has prided itself on its position at the crossroads of the East and West, the legacy of a colonial history that made it a distinctive city in the world. 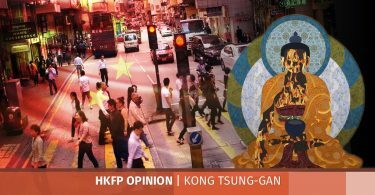 However, when foreign cultures come into close contact with Hong Kong’s core values, are they welcomed as catalysts for fertile stimulation, or rejected as insidious incursions? Twenty years after Hong Kong’s return to China, the smooth cultural integration that some may have hoped for between the two banks of the Shenzhen River has failed to materialise. If anything, tensions and contradictions have only intensified. The intense backlash to the government’s plan to build a Hong Kong Palace Museum in West Kowloon is a case in point. The value of cultural exchanges is, however, indisputably rising. Local universities have been working harder than ever to recruit more overseas students. Likewise, it is now commonplace for secondary and even primary schools to organise overseas exchange trips for students to, proverbially, broaden their horizons. Globalisation has dissolved boundaries and facilitated interactions between cultures. Some see such encounters as hugely beneficial to the generation of creative ideas. However, anti-globalisation activists argue that many cultures worldwide face the risk of being reduced to homogeneity, as cultures from the West or wealthy countries dominate and erode local differences. To understand how the dynamics of reactions to culture mixing work, my team at The Chinese University of Hong Kong conducted a series of experiments. The research found that people who are more open-minded and confident of their own culture are keener to explore foreign cultures and more likely to generate new ideas. On the contrary, those who lack confidence in their own culture will be more wary of its ‘contamination’ or erosion by a foreign one. The experiment first tested the participants’ reactions to instances of culture mixing, for instance how Hong Kong people responded to coffee-flavoured mooncakes by Starbucks, or how Beijingers took to the golden arches of McDonald’s rising over the Great Wall. Afterwards, we tested how well they received foreign cultures and how that related to their performance at creative tasks. What we found out is, when people react to an instance of culture mixing as a threat to their own culture, their creative performance will drop. However, the same reactions were not found among those who were more open-minded, and they fared better in the creativity tests. Culture mixing is therefore a double-edged sword. On the one hand, it can harness creativity and generate economic and social value among the open-minded. Creativity spurs the blending of seemingly unrelated cultural items, often to surprising effects. 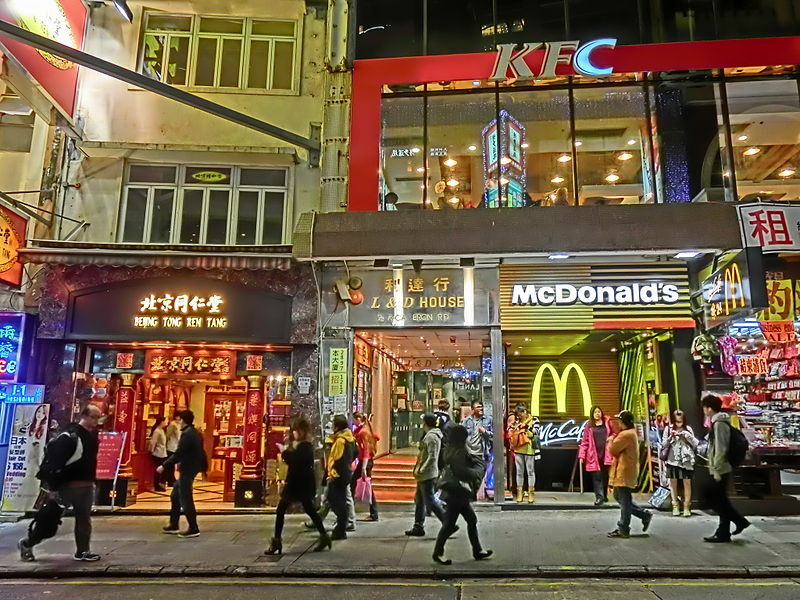 A McDonald’s in Hong Kong. Photo: Wikipedia Commons. Ice cream mooncakes by Häagen-Dazs is a modern Sino-Western hybrid dessert that springs to mind. Similarly, the local accessories brand GOD is celebrated for its playful twist on symbols of everyday life from 1960s and 1970s Hong Kong. And going back slightly further to the early 1990s, the fusion of Chinese and Western fashion designs in the brand Shanghai Tang by the late entrepreneur David Tang is an unorthodox marriage of cultures that still gets talked about today. Yet, culture mixing can also lead to conflicts if insensitively done. Imagine if one day a statue of Mao Tze-tung was erected in Statue Square, or if a replica of the Monument to the People’s Heroes in Tiananmen Square appeared by the Tsim Sha Tsui Clock Tower, how would the public react? So how can cultural mixing be successful and stimulate creativity? There are three conditions. First, the identity of the local or receiving culture cannot be salient, meaning that when it encounters a foreign culture, it will not respond by defensively framing itself in terms of a race or nation. Second, a local culture has to be confident about itself, and not see a foreign culture as a threat. 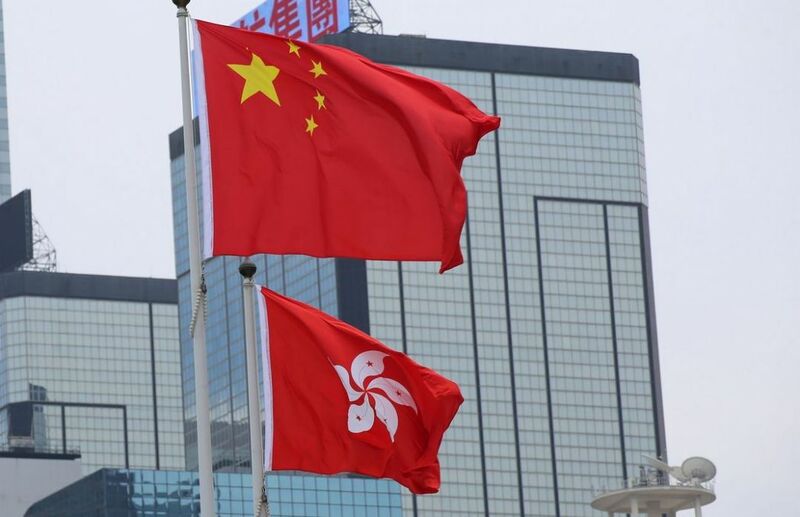 Many Hong Kong people once proudly regarded themselves as Chinese, would root for mainland Chinese sportsmen at the Olympics and were excited about the country’s exploits in space. 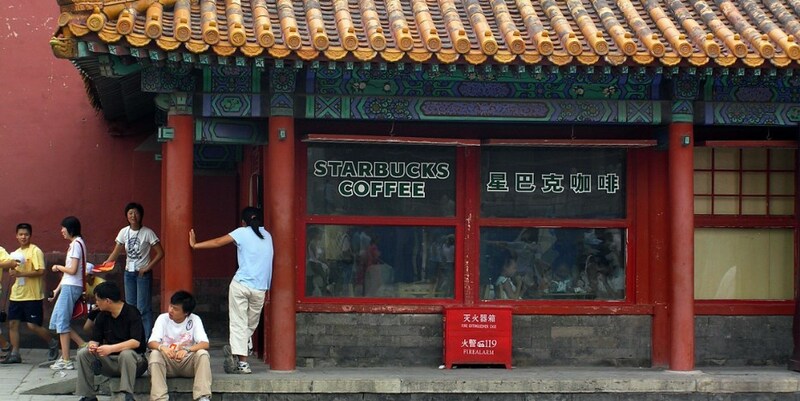 A since-removed Starbucks in the Forbidden City, Beijing. Photo: Wikicommons. 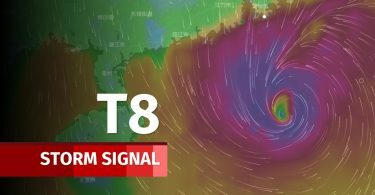 However, Hong Kong people today worry that their own culture and the city’s core values are being eroded by increased contact with mainland China. As a result, they resist mainland Chinese culture. Third, schools should be the cradle of creativity. However, with the local emphasis on drills and rote-learning, students barely get a chance to play imaginatively. Instead of focusing on standardized tests, schools should promote innovation and “out-of-the-box” thinking, which will help the young grow up to be more open-minded about foreign ideas. Elevated self-confidence is a prerequisite to positive culture mixing. In recent years, Taiwan has actively promoted creative cultural industries and successfully built a “new Taiwan culture” which incorporates indigenous and Japanese cultures. Hong Kong needs a revitalized local culture that it can be proud of and to serve as the strong anchor that enables mixing and assimilation of foreign cultures. Certain pre-conditions therefore have to be in place before culture mixing can take place. Otherwise, it is best to let the status quo continue rather than for a foreign culture to make any unilateral attempt to reshape the core values of a local culture.